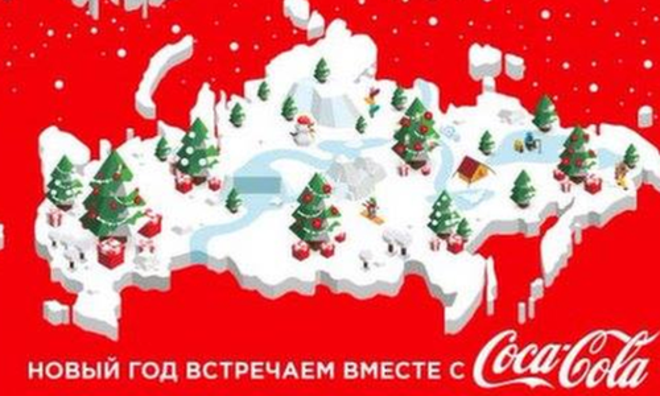 KIEV, Ukraine -- Ukrainian social media users have called for a boycott of Coca-Cola after it posted a festive map of Russia that included Crimea. Coca-Cola republished the map to include Crimea following complaints from Russians. Coca-Cola has now removed the image altogether and apologized. "The company has removed the post and apologises for the situation that occurred." "Coca-Cola's actions violate the official US position condemning Russia's illegal occupation of Crimea, which is and has always been an integral part of Ukraine." "Celebrate winter holidays from Moscow to Vladivostok." Following condemnation from Russians, it republished the image to include Crimea and went further, including the Kuril Islands - seized by Russia shortly before Japan's surrender in World War Two in 1945 - and Kaliningrad, a Russian exclave annexed from Germany in the same year. "All countries which are the main market of Coca Cola like the European Union, the United States, they actually (are) recognising Crimea as a part of Ukraine and they've put sanctions against Russia. Oleh Lyashko, a populist Ukrainian politician, vowed that he would "never ever in (his) life drink Coca-Cola again". He also posted an edited image of the Coca-Cola poster, with the words "Betrayal" replacing the brand's name. Some - like Facebook user Volodymyr Petrenko - accused Coca-Cola of being "fascists". Crimea was taken over by Russia in 2014 following months of protests that led to the downfall of Ukraine's pro-Moscow President Viktor Yanukovych. The majority of Crimea's 2.3 million population identify as Russians and speak Russian.